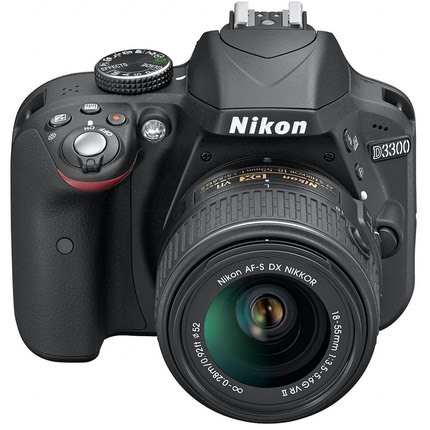 Nikon today at CES announced the entry-level D3300. Not a heck of a lot of changes: they took the AA filter off, upped the frame rate from 4 to 5 fps, boosted ISO sensitivity down and up a stop, added 1080P/60 to the video side, stuck in an easy panorama mode and a few additional Scene and Guide tweaks, and then retired to the Saki bar to celebrate their "new" camera. Not that any of these changes are ones I'd argue with. They make an already good camera slightly better. Along with the camera we get a new 18-55mm f/3.5-5.6G DX AF-S VRII lens. The lens now retracts to a far smaller profile. Coupled with a little downsizing of the body (ala the D5300), this appears to be Nikon's answer to APS mirrorless. "35% smaller and 25% lighter" claims Nikon, though most of that reduction is due to the lens. The lens is mostly the same optical formula, though there's been a small change around the aperture area. Curiously, the MTF charts for the new version show considerable improvement at the wide angle end (though now with a touch of field curvature) and a slight improvement in the telephoto end. It really doesn't seem like the change in orientation of those three elements could result in such a significant change, but it appears that it has. This would be good news if it proves out in the field, as the 24mp sensors were starting to show the corner issues of the old 18-55mm very readily. I've added the new camera and lens to the database pages. Both should ship in late February. Nikon is going around saying that the D3200 will remain in the lineup. Of course it will, as both retailers and Nikon still seem to have a plentiful stock of it. Both Canon and Nikon seem to be in a multigenerational mood these days, which allows them to price cameras in incredibly small increments, sometimes only US$50 apart now. Still feels like channel stuffing to me. Yes, there's a negative tone to this article. I can't help it, sorry. I've been supporting Nikon on the Internet for over 15 years now, and this latest cycle of updates is a real head scratcher. Why the D3300 doesn't at least have built-in WiFi, I don't know. I'll repeat what I've written last year: I'm hoping that the Junior Team engineering we're seeing on the incremental updates is a sign that a Senior Team is working on the future of Nikon's interchangeable lens cameras. Don't get me wrong. The D3300 almost certainly will be an excellent entry-level DSLR, but so was the D3200. The bar didn't move all that much. I'd also have to guess that the 18-55mm lens isn't going to show off that AA filter removal all that much, too. I'll repeat what I wrote earlier in the week: if you're buying into this level of Nikon DSLR, please do yourself a favor and buy the 35mm f/1.8G DX lens, too. That modest-cost lens does show off what the 24mp sensors Nikon is using can achieve.